Mixed media paintings with nails by Günther Uecker who began working with nails in the 50s. Jack Whitten has been painting for over 50s from his early work influenced by De Kooning in the 60s to recent work influenced by contemporary technology such as e-stamps and smartphones. 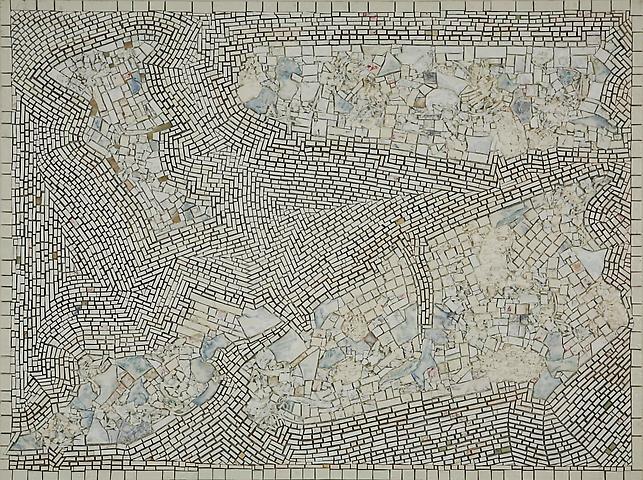 His current work involves pieces cast acrylic paint which are collaged onto canvas using a mosaic-like method. The American artist collaborative, Anonima Group, was founded in Cleveland, Ohio in 1960 by Ernst Benkert, Francis Hewitt and Ed Mieczkowski. Propelled by their rejection of the cult of the individual ego and automatic style of the Abstract Expressionists, the artists worked collaboratively on grid-based, spatially fluctuating drawings and paintings that were precise investigations of the scientific phenomena and psychology of optical perception. I've mentioned Guillermo Kuitca a number of times on this blog before and here are a couple of videos I've come across today. The first is Kuitca's piece Stage Fright which is described on Youtube as "animation for Kuitca's Show at Gallery Met at the Metropolitan Opera House, New York. 2007". The piece relates to the artist's series of "drawings" involving inkjet prints of coloured theatre seating plans being dipped in water of varying temperatures. The second is the first of a three part conversation between Kuitca and the curator Douglas Dreishpoon Albright at Knox Art Gallery, Buffalo NY. The other two parts can be found on this youtube profile. Terry Winters will be exhibiting at IMMA in summer 2009. There have been a lot of articles in the press recently about Francis Bacon due to his major at Tate Britain. Most I have seen mainly focus on his personal life and those that deal with his work are full of unquestioning praise of his genius. Adrian Searle has an article on the Guardian's website that offers a refreshing alternative perspective on his work. Searle admits that certain works by Bacon are "essential" but also makes the fair criticism that Bacon had a tendency towards mediocrity and repetition in his later work. The article is to be found here. Here are two artists who's work involves a time-consuming, sculptural accumulation of paint without supports such as canvas or paper. Craig Staff interviewed on Circa's website.